A few weeks back I was called to a home where the owner had just moved in. The property was edging onto a wooded area, and the home owner wanted peace of mind that the guttering was clear. I set up my gutter cleaning equipment and completed the gutter clean on the top level. I used my gutter-cam to check the condition of the gutter netting in the conservatory gutters after being told it was fitted. The netting hadn’t been fitted particularly well, or had been fitted some time ago. It wasn’t stretched full across the width of the gutter in all places, but would still have stopped nearly all the leaves settling in the gutter, which is what it is designed to do. I moved my camera to one span of the gutter and came across this. There is no leaf matting in the gutter, but you can make out the moss growing through the netting! Of course, the fixed netting makes this impossible to remove with a vacuum system, so I advised the home owner that should he remove the netting, I’d come and clear the gutter for free. Don’t forget that even though this was on a conservatory, none of this could be viewed from the ground, although you could reach up and feel the moss, once I knew where to feel. 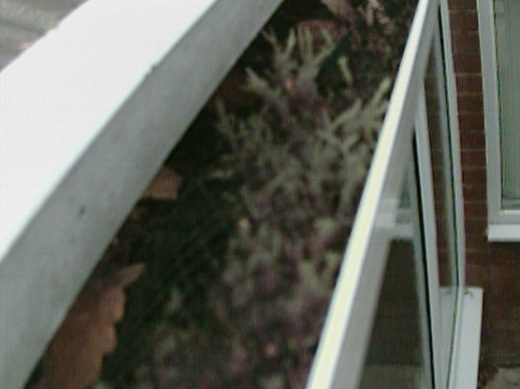 If you are looking for gutter cleaning in Telford, you can request a quote here.